College: helped the University of Ottawa Gee-Gees’ defensive squad lead the OUA by scoring a total of 14 interceptions in 2017, one in the team’s quarterfinal matchup. 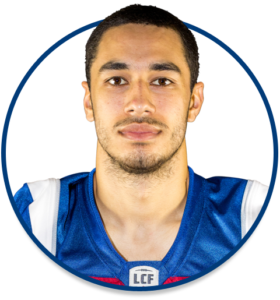 A few weeks after taking part in the Alouettes training camp, the 23-year-old began his final collegiate season during which he made 30 tackles in eight games, while forcing two fumbles and recovering one. He also knocked down four passes. He completed his university career with 159 tackles in 38 games.